When you arrive here, you will feel like you are home. After golfing, traveling, wine tasting, etc.. kick back take a nice long nap on the cozy couch or take a deep relaxation bubble bath. Turn on Netflix from 3 TV's and watch your favorite movie! Enjoy cooking your favorite meals and eat inside or outside in the Arizona room. Turn on Pandora and play a little pool, ping pong, board games or poker...Enjoy your evening wine or cocktail time in private master suite. Escape to the patio and enjoy the fresh air. Hang out in the slumber party bedroom with your friends tell your favorite stories, play games. Walk to shops, restaurants and Starbucks on Glassford Hill Road. We are a family with 6 children. 1 boy and 5 girls. We have 2 little ones still living with us. We travel to AZ several time a year and have stayed in hotels in the past which was always miserable for me and the kids so we decided to buy a vacation home for our family so we could have fun and relax and play while on vacation! We love this house so much that we wanted to share our experience with you. We furnished our home with everything we would use if we lived her full time. It's close to shopping, schools, restaurants and activities which makes it a perfect little hide away for us! We hope you enjoy your stay here and look forward to seeing you again! This is our happy place house! It has a wonderful spacious floor plan! Perfect for entertaining and having big dinners! The game room is always very popular! I enjoy having a glass of wine sitting outside on the veranda reading a book. The beds are very comfortable and all brand new! I sleep like a baby here no matter how hard I played the night before! It's really fun to be able to get cozy on the couch, watch Netflix all night. Great for special events or just relaxing after playing all day and exploring! Very comfortable and cozy feel. Cook your Turkey, Ham, Roast Beef or Prime Rib or what ever you fancy for Thanksgiving or Christmas! We have everything you need! There are endless activities you can do all around Prescott Valley and the surrounding area. 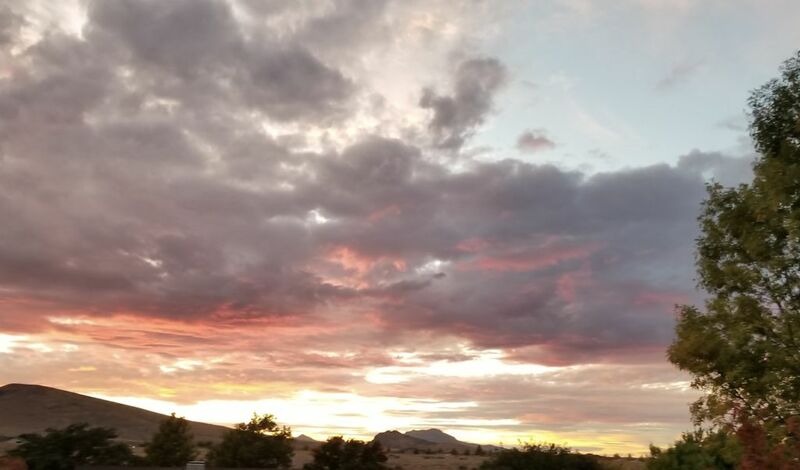 Prescott Valley is centrally located so it's easy to do your special tour and come back home to make dinner and relax with your glass of wine. The game room is wonderful! Our kids absolutely love it and play pool or ping pong all day long! We will keep adding more to our home as time goes by. We hope you enjoy your stay and look forward to making your stay wonderful! Crisp white linens enough for each guest. Plenty of white towels enough for all guests. 3 Flatscreen TV's with free Netflix Pandora and more! Please only use powder detergent not liquid in AZ. Stainless refrigerator with ice/water maker! Has well stocked kitchen with most tools you need! Even a turkey platter, turkey cooking tray, and all the tools you need to make your holiday meals! Huge kitchen! Lots of countertop space! Bar area, and tons of cabinet space! Very convenient and hard to find in a vacation rental! Very nice dining room! Cute dining table outside on veranda. Monopoly, Chess, Checkers, Poker, Puzzles, Coloring Books and more! Pool Table and Ping Pong Table, all the equipment included! Enclosed deck with chairs and table set. You are going to love this house! It's a true getaway! We want you to relax and have fun! Conveniently located close to all the shops, food, gas, movie theater, library, and Starbucks!!! Great hiking trail located down the street if you enjoy outdoors! Located in the new Granville development. Close to freeway access if you plan to go on any day trips! We had a great relaxing time. It was very cozy and clean. Would recommend if you're looking to stay in Prescott Valley! We really enjoyed our 3 days at this home in Prescott Valley. It was close to our son's house, plus all the shops and restaurants on Glassford Hill Rd. All the TVs and the pool table/ping pong table were great for the kids. I would definitely stay here again. Outstanding!!! Absolutely Loved Our Stay!!!! We had an amazing good time here! My family stayed here while my husband was on a business trip. He goes to Prescott Valley every year. We usually stay at the hotel which was full this year. This was our first time staying in PV at a vacation home. We brought our baby and kids. The master bedroom was huge with a huge walk in closet! We could easily place our baby crib next to the bed with plenty of room! We watched TV in bed and had our adult quiet time and wine outside our French Doors on the patio. We had such a good experience in this house that I will never stay in a hotel again! My kids played games that were provided at the house and they had their own slumber party bedroom! They loved the toys. I was able to cook many amazing dishes! This house had everything we needed to make our stay very comfortable and relaxing! We felt like we were at home! My husband enjoyed sitting in the wrap around porch with a cold beer after his long day working. He was able to BBQ our steaks and relax and feel like he was on vacation! We watched several movies on Netflix together as a family. The kids watched Pandora while they played pool and pingpong. That was a very good idea! Kept my kids very entertained! We walked to the local Starbucks every morning to work off all the extra calories that we ate from all my good cooking. We found a lovely hiking trail down the street that was great for all of us! We hung out in the covered patio and enjoyed much needed husband and wife bonding time. The kids were sad when we had to leave. They asked if we could come back here every year! We can't wait to come back here next year! They were priced below what we were expecting for all that this home had to offer! Thank you so much for letting us stay at your wonderful home! We made many wonderful memories here and would recommend this house to everyone! My family and I stayed here for a week and it was a great vacation home for us! The location was in a quiet neighborhood and close to town and stores. The house itself had everything you would need while on vacation, a home away from home feel. There were toiletries, fully stocked kitchen, even toys and games were provided. Very clean and great floor plan. I highly recommend this vacation rental if you are looking for a cute, cozy and clean place to stay! Extra charges will be added to your bill if utilities are used in excess.